Initiate a referral on behalf of your patient or to request a physician-to-physician phone consultation. Inquire about self-referrals or selecting a UC Davis doctor, contact the Consumer Resource Center. To see if D. Gregory Farwell is accepting new patients, or for assistance finding a UC Davis doctor, please call 800-2-UCDAVIS (800-282-3284). I take great pride in offering our patients the highest quality of care that is based on the latest research and cutting edge technologies. Whether it is our minimally invasive approaches to thyroid and parathyroid surgeries, the use of the robot in cancer treatment, or our comprehensive reconstructive techniques, I strive to do everything possible to treat my patients in a manner that gives them their absolute best chance of cure while optimizing their functional and cosmetic results. Dr. Farwell?s clinical practice has centered on the comprehensive management of head and neck malignancies including thyroid and parathyroid surgery. He has special interests in laser and robotic microsurgery of upper aerodigestive tract tumors and reconstructive surgery after traumatic and oncologic defects. His comprehensive approach to patient care allows the entire gamut of reconstructive surgery to be utilized to optimize his patients functional and cosmetic results. 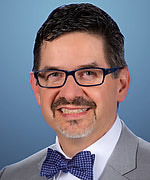 He has worked extensively on improving patient functional outcomes with microvascular organ replacement strategies and rehabilitation with coordinated speech and swallowing therapies available here at UC Davis. His research endeavors include multiple collaborations with the UC Davis Department of Biomedical Engineering working on noninvasive and minimally invasive technologies to diagnose neoplasms, novel and improved PET tracers, unique approaches to therapeutic drug delivery to neoplasms, and high-resolution imaging technologies. He also works closely with colleagues in the Department of Radiation Oncology to evaluate novel treatment strategies to minimize radiation side effects and maximize patient functional outcomes. Our first line of research is an RO1 NIH Grant evaluating noninvasive fluorescence assay of tissue during robotic surgery to improve cure and maximize function in patients with cancers of the tongue and tonsil. This has tremendous potential to improve our ability to complete remove tumor while allowing us to leave as much normal tissue behind to improve our patients' quality of life. We are training and evaluating the ability of dogs to sniff and detect tumor. This has amazing implications for screening programs to detect tumors earlier. We are also working on multidisciplinary research looking at thyroid cancer to better understand patients at high risk for aggressive disease so that we can customize our treatment to each patient. Bewley AF, Farwell DG. Management of orbital tumours. Curr Opin Otolaryngol Head Neck Surg. 2015 Aug;23(4):309-15. Harris BN, Biron VL, Donald P, Farwell DG, Luu QC, Bewley AF, Chen AM, Daly ME. Primary Surgery vs Chemoradiation Treatment of Advanced-Stage Hypopharyngeal Squamous Cell Carcinoma. JAMA Otolaryngol Head Neck Surg. 2015 Jul;141(7):636-40. Biron VL, Bang H, Farwell DG, Bewley AF. National Trends and Factors Associated with Hospital Costs Following Thyroid Surgery. Thyroid. 2015 Jul;25(7):823-9. Semrad TJ, Semrad AM, Farwell DG, Chen Y, Cress R. Initial treatment patterns in younger adult patients with differentiated thyroid cancer in California. Thyroid. 2015 May;25(5):509-13. Yu Y, Daly ME, Farwell DG, Luu Q, Gandour-Edwards R, Donald PJ, Chen AM. Level IB nodal involvement in oropharyngeal carcinoma: implications for submandibular gland-sparing intensity-modulated radiotherapy. Laryngoscope. 2015 Mar;125(3):608-14. Luo Z, Loja MN, Farwell DG, Luu QC, Donald PJ, Amott D, Truong AQ, Gandour-Edwards R, Nitin N. Widefield optical imaging of changes in uptake of glucose and tissue extracellular pH in head and neck cancer. Cancer Prev Res (Phila). 2014 Oct;7(10):1035-44. Chen AM, Daly ME, Cui J, Wooten HO, Farwell DG, Purdy JA. Helical tomotherapy with simultaneous integrated boost dose painting for the treatment of synchronous primary cancers involving the head and neck. Br J Radiol. 2014 Aug;87(1040):20130697. Chen AM, Wang PC, Daly ME, Cui J, Hall WH, Vijayakumar S, Phillips TL, Farwell DG, Purdy JA. Dose--volume modeling of brachial plexus-associated neuropathy after radiation therapy for head-and-neck cancer: findings from a prospective screening protocol. Int J Radiat Oncol Biol Phys. 2014 Mar 15;88(4):771-7. Hess CB, Rash DL, Daly ME, Farwell DG, Bishop J, Vaughan AT, Wilson MD, Chen AM. Competing causes of death and medical comorbidities among patients with human papillomavirus-positive vs human papillomavirus-negative oropharyngeal carcinoma and impact on adherence to radiotherapy. JAMA Otolaryngol Head Neck Surg. 2014 Apr;140(4):312-6. Chen AM, Daly ME, Luu Q, Donald PJ, Farwell DG. Comparison of functional outcomes and quality of life between transoral surgery and definitive chemoradiotherapy for oropharyngeal cancer. Head Neck. 2015 Mar;37(3):381-5. Epub 2014 Apr 3.